In this issue, we meet the Neo Mavericks. Some of them have full names, some of them only have one letter names. Laziness or what? Who knows? Roll has another flashback throwing her into berserker rage, Ecks makes a reference to a German F1 racer, and Rock mourns the loss of some tokusatsu VHS tapes. Oddly, Roll keeps her clothes on for a second issue in a row, although she’s suddenly changed clothes since the last issue anyway and lost her pants in the process. 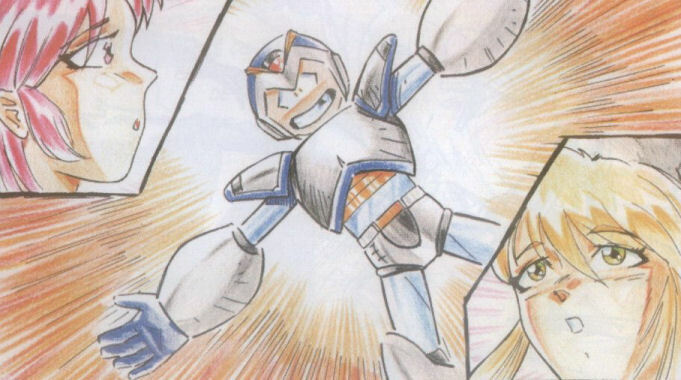 This entry was posted in New Adventures of Megaman and tagged mega_man, megaman_BR, pt-BR. Bookmark the permalink.